OK. If the title of this post made absolutely no sense to you-- google 241543903 right now and then click on images to see the meme that is seeing out the old year and welcoming in the new on the internet. 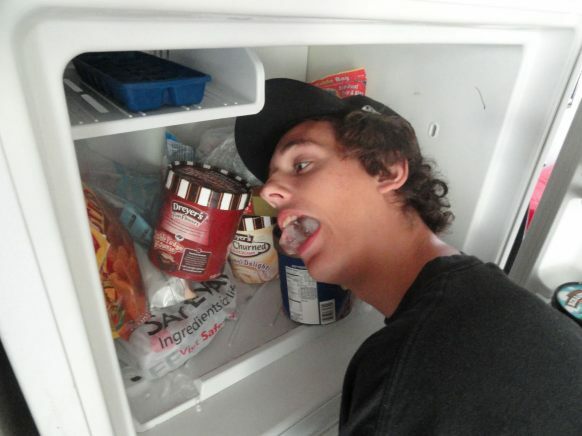 "The head-in-a-freezer photo meme was started in April 2009 by David Horvitz, a New York artist known for (among other things) starting a subscription service for his daily photos of the sky. At the time, Horvitz was running a Tumblr where he would post instructions to his audience each day. These were generally off-the-wall things like "record a dramatic reading of a YouTube comment fight" or "ask to watch the sunset from the roof of the tallest building near your house." In November of this year, David had a book of these instructions, Everything That Can Happen in a Day, published by Random House. Taking a photo with your head in the freezer and tagging it with the seemingly random number "241543903" was one of these instructions. Horvitz told us he got the idea after telling a sick friend, Mylinh Nguyen, to try sticking her head in a freezer. The number Horvitz picked was a combination of the serial number of his refrigerator and the barcodes on a bag of edamame and a package of frozen soba noodles he was keeping there." Thus we see the power of the internet and the social networking phenom of people doing something intrinsically silly just for the sake of doing it....together. Somebody has got to be laughing all the way to the bank as there is now a website, a Twitter account, a Facebook page and who knows what else devoted to 241543903. Bloggers are on it. Can Tee shirts, coffee mugs and needlepoint pillow patterns be far behind ? I'm thinking New Years Eve, head in the freezer, shots could be very cool and I may just follow up on them-- so experience the meme, do the meme, BECOME the meme ( I am assuming the lotus position, eyes closed and chanting) and by all means leave links to your photos in the comments section if you care to. Happy New Year from the pinkpackrat ( who will definitely NOT have her head in a freezer this New Years Eve), but who will be watching this strangely fascinating meme in the year to come. May 2011 bring you and yours health, happiness and many memorable memes. You always come up with the coolest finds! This is awesome. Went to the site and was simply mesmerized. Fun! Happy New year Frieda-- I knew this was your kind of thing-- I'll be watching your blog for your take on it-- isn't it a hoot?